No holds barred, bare knuckled, full throttle attacking football is to be on display when Bayern Munich lock horns with title rivals Borussia Dortmund at the Allianz Arena Saturday night. Only two points separate Germany’s two biggest clubs going into the Bundesliga home straight. The country’s two best supported clubs began last weekend separated by goal difference but Bayern Munich were held to a one-all draw at Freiburg. Two late goals from super sub Paco Alcacer meanwhile saw Lucien Favre’s Signal Iduna Park outfit outlast Wolfsburg to regain outright leadership of the division. On Tuesday night, six time defending champions Bayern Munich survived a massive scare in the DFB Pokal (German Cup) when defender Nicklas Sule was sent off and they went 1-2 down before the breather against lower division Heidenheim. It took the second half introduction of the, 200-goal highest scoring foreigner in Bundesliga history, Robert Lewandowski, to turn the game in the Bavarians favour. 5-4 was the final score. Lewandowski is no stranger to Dortmund as he spent three years at Signal Iduna Park, helping then manager Jurgen Klopp to a pair of Bundesliga titles. 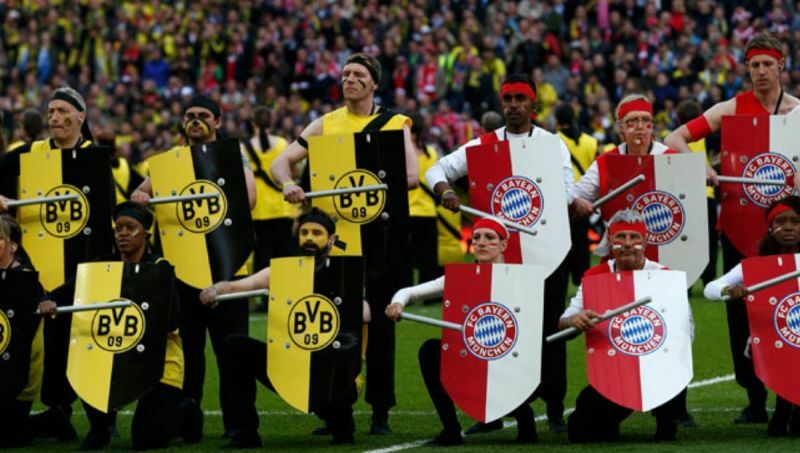 The Pole will once again be the Bavarians main goal threat against the Black and Yellows. On the other hand, Bayern Munich will pay special attention to Mario Goetze, who spent three trophy laden years at the Allianz Arena. An equally compelling duel takes place at the Bay Arena where Peter Boaz’s talented but inconsistent Bayer Leverkusen host Ralf Rangnick’s free scoring Red Bull Leipzig. Leverkusen were read the riot act after they uncharacteristically fell 1-4 to Hoffenheim last weekend. Leipzig had no such problems as they dismissed Hertha Berlin 5-0. League action starts on Friday with Mainz taking on Freiburg and ends with a Sunday night double header featuring Augsburg versus Hoffenheim and Borussia Moenchengladbach up against Werder Bremen. Stuttgart, who occupy the playoffs spot, are at home to relegation threatened Nuremberg on Saturday afternoon.